Do you crave deep conversations on race, education, and culture? Is reading The Highlighter newsletter every Thursday not enough for you? Talented writers and loyal readers chat with Editor in Chief Mark Isero about the best articles of the week. Want to ask a question, share your thoughts, or be on the show? Email Mark at mark@highlighter.cc or leave a voicemail at (415) 886-7475. When I featured “79” as one of last year’s best three articles (see Issue #173), naturally I wanted to speak to author Brian Broome. He graciously accepted the invitation, and I’m honored to present our conversation to you, loyal Highlighter Podcast listeners! In the interview, Brian talks about how he became a writer in rehab, how the first piece of writing he submitted got published, and how “79” began as a rant against white supremacy. We also explore the effects of capitalism and white supremacy on Black people and the perils of respectability politics. If you haven’t read “79” yet, do so now! and then come back to listen to our conversation. Also, you’ll want to check out more of Mr. Broome’s writing, so head on over to brianbroome.com. As always, I’d love to hear your thoughts about this episode. Email me at mark@highlighter.cc or leave a voicemail at (415) 886-7475. If you’re valuing this podcast, please write a review at Apple Podcasts. Thank you very much for listening! Why are we still teaching reading the wrong way? Why are so many educators ignoring settled research and brain science and doing their own thing instead? In “Hard Words: Why Aren’t Our Kids Being Taught to Read?” Emily Hanford investigates these important questions. Emily’s documentary was featured in The Highlighter #162, and it was wonderful to have a conversation with her. Also check out Emily’s recent piece in the New York Times, “Why Are We Still Teaching Reading the Wrong Way?” If you have questions or comments about reading instruction, please email me at mark@highlighter.cc or leave a voice message at (415) 886-7475. Anne interviews San Francisco first grade teacher Kristin Smith about why she doesn't assign homework, how to create a reading culture through book choice, and how to get the resources needed to do it (http://www.childrensbookproject.org). Last month, we did a deep dive on reading instruction. Now it’s time to reflect on what we learned and to share some of our highlights. It’s also time to realize that we’ve just scratched the surface on reading — and that the topic deserves another month of study! Also in this episode: Anne shares her favorite article of the month from the newsletter, and Mark shares his favorite podcast episode selection from Anne-otations. We’re in a bantering mood, so please enjoy! We’d also like to hear from you. Do you think podcasts in the classroom should be considered reading? Also, what do you do if you have a ton of content to cover but know that teaching reading is important, too? Call and leave a voicemail at (415) 886-7475. Don’t be shy! Joan Cone is a retired English teacher who taught for more than 40 years. In the middle of her career, she changed the way she taught her class in an attempt to support young people to love reading. Ms. Cone wrote about that transformation in her article, “Appearing Acts,” published in the Harvard Educational Review. The piece was featured in The Highlighter #137 as well as in Podcast #34. In this episode, Ms. Cone emphasizes that teachers need to keep trying new ideas, to remain in an inquiry stance, and to listen to their students. Highlighter Podcast listeners, we invite you to leave a voicemail with your thoughts at (415) 886-7475. Also, please take the annual subscriber survey at j.mp/highlightersurvey18. Thank you for your support! Dr. Arce has worn many hats in education: bilingual elementary school teacher, literacy specialist, head of San Francisco State's Literacy Specialist Program, and now head of SF State's Department of Elementary Education. Hear her advice for teachers (Stand! Organize! Resist!) as well as school leaders (spend more on teachers and good books) then share your thoughts at 415-886-7475. If you have time, could you subscribe, write a review, and recommend to a friend? Thanks! Before John was an author, CEO, and literacy education advocate shaking hands with the president and being a guest on Oprah, he was a college-educated high school teacher who didn't know how to read. Hear his remarkable story, his hopes for American education, and his advice for teachers today. For more information, head to johncorcoranfoundation.org or find The Reading Gap and EBLI on Facebook. Mark goes on assignment and interviews three excellent reading teachers in San Francisco. Todd Smith, Nick Nordlinger, and Shannon Jin-a Lamborn talk about how they’ve built readers in their high school classrooms, plus we discuss this month’s lead article, “Appearing Acts,” by retired teacher Joan Cone. Please take a listen! Also, we’d love to hear from you. Leave your thoughts at (415) 806-8175. 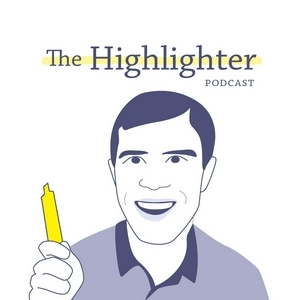 If you don’t subscribe yet to The Highlighter newsletter or podcast, now’s the time: highlighter.cc/subscribe. Have a great week! This month, we’re focusing on reading — one of our favorite topics. Hope it’s a passion of yours, too! In this episode, we begin with a startling statement about young people’s reading habits. Then we chat about how reading emerged as an essential part of our personal and professional lives. Finally, we offer a preview of what’s in store for this month. If you’re an educator, or a person who cares deeply about reading, this month is for you! Please leave a voicemail at (415) 886-7475 with your thoughts. What questions do you have about reading? What do you want to learn about? Thank you for listening! Anne and Mark conclude this month’s deep dive on college with some reflections, highlights, and student voice. What began as a general focus on college ended up centering on the experiences of first-generation college graduates — who make up 1/3 of all college students today. Why aren’t their voices more represented? Also on today’s episode: Anne finally asks Mark what he’s reading, plus we preview next month’s topic. If you’d like to be on the show, leave us a voicemail at (415) 886-7475. Have a great week! Anne interviews two former students who graduated six years ago to learn how well prepared they felt for life after high school. Rosie Leyva is a third grade teacher in Oakland and a first-generation college graduate. In this episode, Rosie discusses her experiences in college and explains why she connects deeply with this month’s lead article, “Who Gets to Graduate?” If you want an extra dose of inspiration, listen to the end when Rosie describes how she builds a college-going culture for her current students. Christine Rhee is a loyal subscriber, loyal listener, and loyal San Francisco Giants fan. She's also an attorney in San Diego and former criminal prosecutor. On the show, we talk about predictive policing and the article, "Can You Arrest People Before They Commit Crimes?" which appeared in The Highlighter #127. Please enjoy and call in with your thoughts: (415) 886-7475. Brittany Flynn is a learning specialist at Impact Academy in Hayward, California. On the show, she talks about what it means to be a learning specialist and about her favorite aspects of the profession. Before serving at the high school level, Brittany worked with young children, one reason she chose "Why Are Our Most Important Teachers Paid the Least?" for our discussion. This article from The Highlighter #126 focuses on the challenges of being a preschool teacher. Please enjoy listening to Brittany's perspective, and feel free to call in with your questions or feedback at (415) 886-7475! Alvin Chang is senior graphics reporter at Vox and the author of the lead piece in The Highlighter #125, which focused on school resegregation. Mr. Chang creates explainers that include data, cartoons, and history. He believes that our society's most challenging problems emerge from the everyday decisions that we make. On the show, Mr. Chang and I talk about how he got into data journalism, how he approached this piece, and what his response is to people who say that integration is not the right solution to our challenges in education. Anne Nyffeler is a great teacher and instructional coach in San Francisco and is the editor of Anne-otations, The Highlighter's new feature! Each week, Anne will select one excellent podcast episode to share. This week, it's "You Had Me at Black." We talk about microaggressions and how white teachers can lessen the violence that many students of color must face in the classroom. Please listen and let us know what you think! Teacher Anne Nyffeler is on the show to unveil Anne-otations, The Highlighter's new feature! Every week, Anne will select one excellent podcast episode for you to listen to and comment on. Anne's first recommendation is "You Had Me at Black," in which an African American college students recounts a story of microaggression in the classroom. Anne and I share our own teaching experiences and consider how to mitigate the violence of microaggressions. Please listen and let us know what you think! Omar Bryan is a talented artist, art teacher, and school leader in the Bay Area. He's also a big champion of The Highlighter! On the show, we talk about how he got into education and how he applies his art background in building relationships with students. We also had a chance to chat about this week's lead article, "Millennials Are Screwed," by Michael Hobbes. Please take a listen! Jamie Marantz is an experienced educator in the Bay Area who works relentlessly to disrupt predictable educational outcomes for young people. She questions school policies that are for the comfort of adults rather than for the benefit of the children. In this episode, Jamie and I talk about two pieces: the NPR article (#121) on Ballou High School in Washington DC and about the Code Switch podcast on Ron Brown College Preparatory High School in Washington DC. This is an episode that will shake you and get you thinking, so please enjoy! Olivia Morales teaches social studies in New Orleans and is the co-founder of Teacher Beasts, which promotes exercise and wellness among educators. On the show, Olivia and I talk about the educational landscape in New Orleans, particularly its emphasis on high-stakes testing and charter schools. We also chat about "The Nationalist Delusion," which appeared last week in the newsletter. Please listen and enjoy! Science teachers Jonathan Wright and Philippe Vanier, friends and colleagues, talk about the lead article from this week's newsletter, "Can Racism Be Stopped in the Third Grade?" Please enjoy! Sonya is a mom, loyal subscriber, and devotee of Oakland. On the show, we talk about choosing a school for her daughter, the stress of buying a house in the Bay Area, and her experience living in the Deep South. Please enjoy! Kati Parker is the first-ever former student of mine on the show! She is great and smart, and we chatted about "The Gentrification of Soul Food." Please enjoy! Nancy leads all things literacy at the Oakland Unified School District, and in this episode, she talks about reading and how we can teach it better. Then we chat about "The Ghosts of the Tsunami." My good friend and loyal subscriber Sejal Patel talks about how best to advocate for your children when facing overworked or insensitive teachers. Also, we chat about "Birth of a White Supremacist." Laura Hawkins is a Math teacher in San Francisco. We talked about whether our divided country has become a tribal one, with all of its negative effects. Is there hope when we can't talk to each other? Nicholas Woo is a data and evaluation associate at Partnership with Children in New York City. We talked about how education reforms just aren't enough if we're really seeking equity for young people. Writer Lauren Markham is the author of "The Girl Gangs of El Salvador" and the new book, The Far Away Brothers. We talk about her writing and how best to serve newly arrived immigrant youth. Professor of education Tony Johnston talks about fireflies, Black masculinity, and Advanced Placement classes. He supports new teachers in Connecticut and believes in the power of reading. Principal Clare Green interviews Eric Foner, DeWitt Clinton Professor of History at Columbia University. They discuss Prof. Foner's recent article, "Confederate Statues and 'Our' History." Niki is a San Francisco native and works in education at SFUSD. We talked about her work, resegregation, charter schools, and Nikole Hannah-Jones's article, "The Resegregation of Jefferson County." Social studies teacher Allison McManis chats with Zoë Carpenter, editor at The Nation, about her article, "What's Killing America's Black Infants?" Tim talks about his first week as a principal in San Francisco, plus counseling, CPS, foster youth, and what it means to serve young people in an equitable way. Michele and I chat about cell phones, Generation Z, and the hope she has for young people and our future, even in these dark times. Academic Data and Assessment Manager Angelina Garcia and I chat about data in education and last issue's article about homeless students in Seattle schools. Please enjoy! Humanities teacher Marni Spitz talks about teaching, equity, her new community in Bend, Oregon, and "Youth From Every Corner," by Kirstin Valdez Quade. It's time to talk to loyal subscribers of the digest! This episode, I got to chat with East Bay artist and art teacher Heidi. Thank you, Heidi, for being the podcast's first-ever guest! My favorite article this week is about Henry David Thoreau and how everything I thought about him was wrong. Welcome to The Highlighter Podcast!